Diamondhead Soprano Ukuleles — A unique music store in Brown County, Indiana! 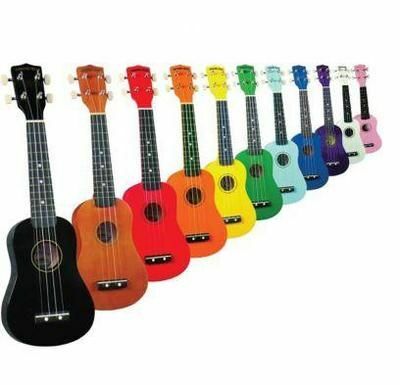 These Diamondhead Soprano Ukuleles in bright and fun rainbow colors are always a huge hit! It is hard to find a ukulele under $50 that is NOT just a toy, but these Diamondhead Ukes definitely fit the bill! With a strong maple body and a gloss or satin finish, these ukuleles have long-lasting durability for the interested little one but with good intonation and playability for any beginner ukulele player. With geared guitar-style tuners and pre-stretched strings, these ukes stay in tune and play great! Now is the time to check out our Friday Feature on these fun ukuleles! Each Diamondhead Soprano Ukulele purchased this weekend (while supplies last) includes Gig Bag, Black Ukulele Clip Strap, and Weed Patch Music Company’s Ukulele Fact Sheet to get you started playing- All for only $39.99!!! Still not sure if these ukuleles can actually be played? Just check out our video below!